Desire and George Barugahare, an ordinary Ugandan couple, who have taken on the challenge of raising children who have been abandoned by their biological parents. With 7 children, 2 biological and 5 adopted, they have huge financial obligations to educate their children on one income. George got a contract to work in Zambia almost 2 years ago. 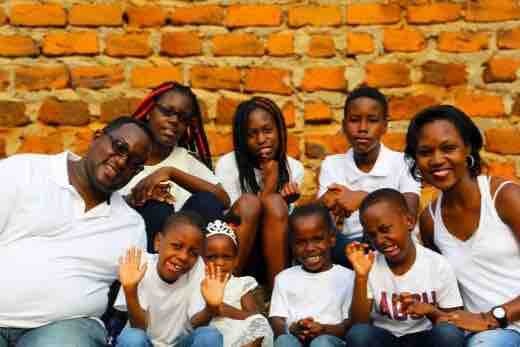 He moved from Kampala to Lusaka with his wife, Desire, and their 4 children at the time. Desire is unable to get employed as she doesn’t have a work permit to work. She stays home looking after the children. So, how did the children come from 4 to seven? June last year, Desire’s mother, who was fostering 3 children who had been abandoned at birth, died so suddenly and the 3 children were unable to move back into the system as Uganda as a country is not yet set up to manage abandoned children. Desire and George are some of the pioneer parents that have legally adopted their children, so the adoption system is still under construction. When Desire’s mother died, the family tried to place the 3 children in another foster home or orphanage but no one was ready to take the 3 kids on. After 3 months of the children staying with Desire’s late mother friends, there was so much frustration on what to do with the kids. George and Desire had just moved to Zambia with hope to improve their lives with a promised job. They already had 4 children (2 biological and 2 adopted). Because there was no other alternative, they decided to take on the extra 3 children and let their mothers’ legacy not go to waste. They legally adopted them in December 2017 and moved them to Zambia. Immediately they got to Zambia, James had to go through an operation on his tonsils and with no Medical insurance, the savings were cut. The Barugahares decided to place all the children into the same school and give them an equal opportunity in life. They added the 2 school-going (James and Emmanuel) in the same school as the older 4 so the school fees almost doubled coupled by the living and medical expenses. Emmanuel is 6 and is in grade 1 too. James’ learning is a little slower than the others and he has struggled the most with the loss of Laura, Desire‘s mother, who had been his foster mum since he was an infant. Makayla was adopted from Sanyu babies’ home. At one month old, her biological mother left her in Mpigi district forest. She was picked up by an early raiser walking in the forest going to work. The by passer heard a baby crying and she picked her up and took her to the police station. She was then placed under the care of Sanyu babies’ home one of the orphanages in Kampala – Uganda. She was adopted by the Barugahares at 4 months old and now she is 11 years old. Joseph’s biological mother handed him over to a lady sat next to her in a public transport car. She told the lady she was going to use the bathroom but she never returned. She ran off and left the 2 day old baby with a stranger. The little baby boy was taken to the police post and a report was made about the baby. The last three adoptions were done at the same time from after the death of Desire’s mother. James was abandoned in 2010 somewhere in Mbarara, a small town in Western Uganda, when he was about 6 months old. All attempts to trace the family by the probation officers were in vain. He was then placed under Laura’s care until they could trace his family members who were willing to look after him but no one was ever traced. Later in 2012, Laura took in another little boy and she named him Emmanuel. Emmanuel’s biological mother got pregnant with him when she was 17 years old by a casual laborer in their village who disappeared when he found out about the pregnancy. Emmanuel’s biological mother was sent to crisis center for pregnant girls. Her parents were very angry at her being pregnant. After she gave birth, she went back to her parents who rejected the child and did not want their grandchild at home with their daughter. Emmanuel was then handed over to Laura as alternative care for the little baby. Khloe was in an orphanage but the orphanage thought she was HIV positive because her skin had a rash and the orphanage could not keep her. Laura took her on because there was no alternative for her. She is not HIV positive after several blood tests; however, there is no trace of her family. Before the orphanage, she had been found abandoned at someone’s gate in the same small town of Mbarara. The Barugahares are very hard working and loving people and they would appreciate if there could be any financial support for the children’s education. They require 3700 GBP per term for all the children to go to school. There are 3 terms in a year. If there is anyone willing to help sponsor a specific child through school, they would appreciate it completely or through the GoFundMe website. Any help to get these lovely children go to school this term will be highly appreciated. This initiative was started by Desire’s sisters. Some will ask why Desire and George have taken on this responsibility when not financially secure? There is no simple answer. We are asking on their behalf for contributions, however small, from all of us to help educate innocent children and give them a chance to a better future. This article was posted in Education and tagged Adoption, Blessings, Education, Family, Support.